Travel the world effortlessly with the Forgan Golf Hard Sided Travel Case. 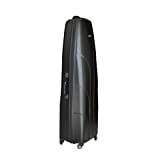 Protect all your clubs and gear in this solid yet lightweight ABS plastic shell that will defend against the abuse the of air travel. Enjoy easy traveling with a stable upright position and four multi-directional spinner wheels couldn’t make it easier to push or pull the bag.